Ginger the heifer stands inside the live creche nativity scene at the Old First United Church of Christ in North Fourth Street, Philadelphia. Stormy the cow — the wandering bovine that twice escaped from a live creche in Philadelphia — is the center of an online petition that has received more than 50,000 signatures from people who want city churches to stop using live animals as "entertainment." Stormy made international news last week, which included reports in New Zealand, Australia, and the United Kingdom, after escaping twice in one day from the manger at Old First Reformed United Church of Christ on North Fourth Street in Old City. Now she's back to the 15 acres where she normally lives at the Manatawna-Saul 4-H Club in Roxborough. Ginger took her mother's place. Stormy gave birth to Ginger in March, and the heifer is expected to remain at the Nativity scene until Wednesday, according to Scott Moser, a volunteer leader for the 4-H club, which cares for the animals. "There are so many ways to celebrate the season without exploiting animals. Since Stormy was being difficult and hard to control, the church has now replaced her with a smaller cow, Ginger. 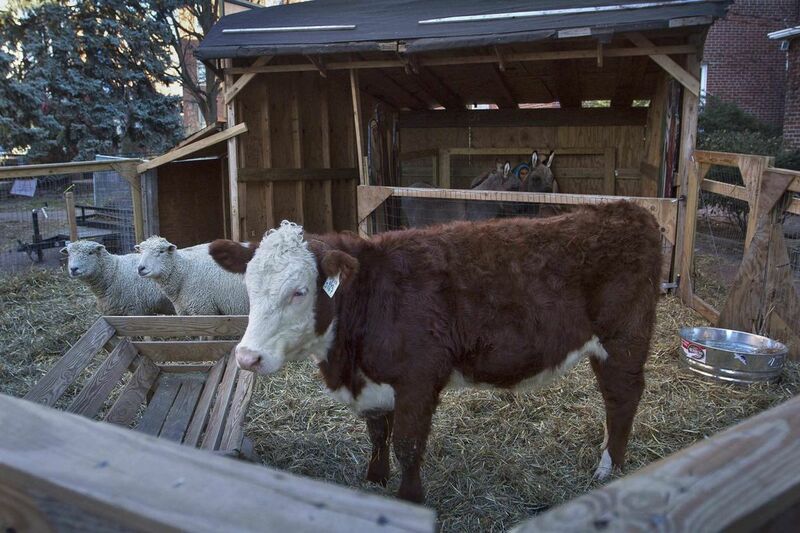 But neither cow needs to be in this live Nativity. Stormy and now Ginger are actually in danger because when Stormy escaped, she ended up on a highway where she could have been hurt or even killed!" the petition by Care2, a global social network for activists, reads. Stormy at rest in an Old City Nativity scene. While Ginger has not been interacting with visitors as much as Stormy had, she seems comfortable at the manger with two sheep, Basil and Blossom, and two donkeys, Sally and Biddi, said the Rev. Michael Caine, the church's pastor. Ginger's big moment will come on Christmas Eve, during a traditional service at the church where Mary arrives at the manger with Joseph. An angel will come through the crowd of worshipers to deliver the baby Jesus to Mary. The celebration has been taking place since 1973, the pastor said. "This is a traditional Christmas celebration," Caine said, adding that the publicity has drawn larger crowds. The services will remain the same this year, he said, but the church is sensitive to the concerns raised. The pastor said it was too early to determine whether the practice would continue in years to come. "There are better ways to celebrate the holidays," said Lacey Kohlmoos of Fairmount, who started the petition. She wants all churches that use live animals to change their practices. "I would just ask the church — kindly — that they not use live animals in the display next year." Stormy's two escapes in one day, as Kohlmoos sees it, means the cow was stressed and did not want to be in that environment. Although Stormy hoofed it very close to I-95 near Callowhill Street, she was not injured. Police and animal control officers quickly took her to safety. The pastor, Moser, and Kohlmoos all agreed that the situation could have been much worse had Stormy been hit by a vehicle, and they said they were thankful that no motorists were injured. It's unclear whether Stormy was able to open the gate or had a human accomplice. The gate has been secured, surveillance cameras are in place, and Caine will remain in a room at the church that overlooks Ginger and the creche. The animals will return to their farms at the 4-H club and W.B. Saul High School of Agricultural Sciences by Thursday. In Roxborough, Ginger will be reunited with her mother, grazing on hay and roaming the pasture with Stormy. Tamara Conaway, principal of the school, said the 4-H club is a separate entity that works with children from age 8 up to care for animals. "It's a marvelous club, and they do a great job working with students," she said. And the club's popular cow? "I think Stormy's got a great life."